If snarling, jagged teeth, a ruthless gleam in the eye and sharp, piercing claws are what come to mind when you think of a predator in the wild, well, think again. 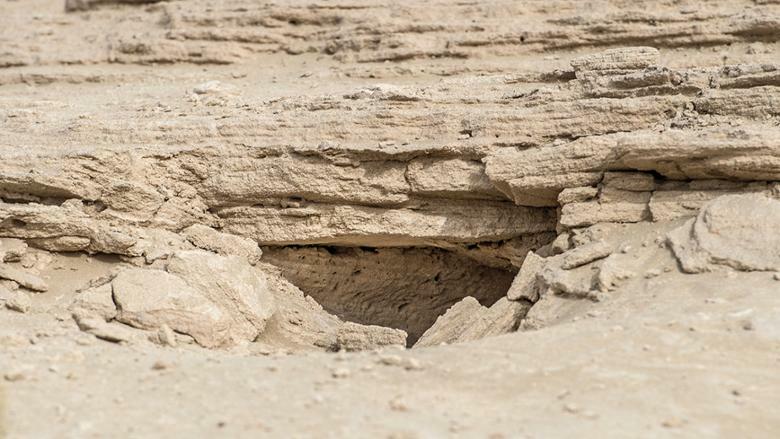 At the Al Wathba Wetland Reserve, situated on the outskirts of Abu Dhabi and just over an hour’s drive from Dubai, it is Claudia Steuber, a geologist and nature-wildlife enthusiast, who first introduces us to a ‘voracious predator and ambush hunter’ of the miniature kind. Called the antlion, this tiny predatory critter is smaller than a little fingernail but is neither an ant nor a lion. Instead, says Claudia, ‘it is the larval stage of the antlion and native species may remain in this state for a year before metamorphosing into a winged creature closely resembling a damselfly or dragonfly with large, ornately patterned wings’. When an ant tumbles into the conical pit, the antlion seizes the unsuspecting prey with its venom-filled pincers sucking the life juices out of the victim. If the ant or insect manages to escape the ferocious jaws, it is still doomed to slide back into the pit as the larva hurls sand into the air, creating a mini avalanche in the walls of the pit. The sand thus slips beneath the ant’s feet when it tries to scramble out and escape becomes impossible as it slides into the waiting jaws of the predatorial larva. ‘The larva antlion’s metamorphic transformation as it flutters off as an adult insect and alters its diet to pollen and nectar, and its incredibly effective hunting trap is a brilliant example of some of the lesser-known wonders of the natural world,’ says Claudia. Following a nature trail in the Al Wathba Wetland Reserve, a five-square-kilometre mosaic of natural and man-made lakes, with Claudia and experts from the Emirates Natural History Group Abu Dhabi, is an eye-opening introduction to not just the teeming plant and animal life of the protected reserve — it is a riveting story of nature that lets you see the natural world in a new light. 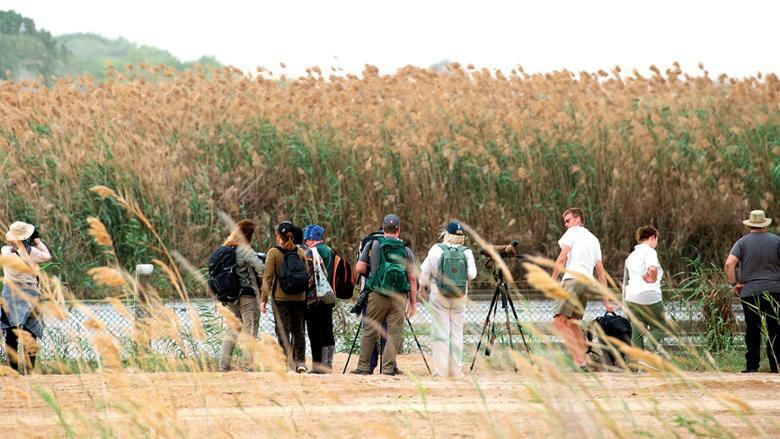 With their wealth of wisdom and trivia, our field guides provide us — a group of around 15 nature enthusiasts — a unique insight into the ecosystem of the wetland reserve, the geological forces that have shaped the landscape of the region, and how conservation efforts are helping preserve its precious biodiversity. 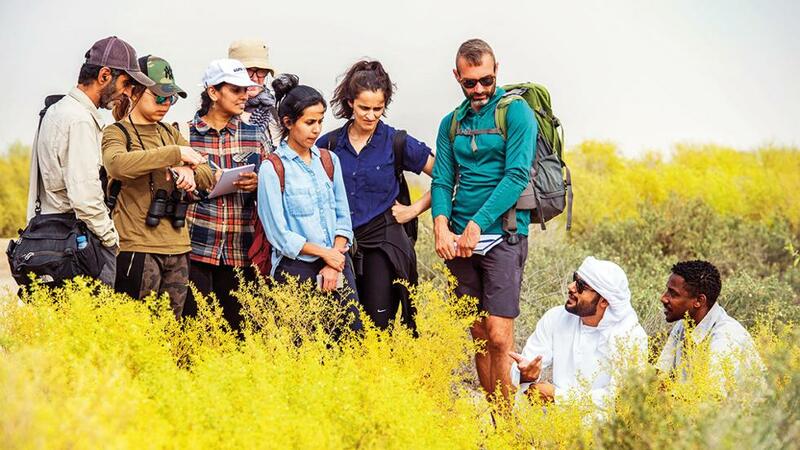 Joining us on the walk is Dr Thomas Steuber, a geologist at the Khalifa University in Abu Dhabi, who leads us to fossil dunes of the Gayathi Formation that were formed 7,000 to 20,000 years ago when the environment in the region was very different from what it is today. ‘During the last Ice Age, this was a land that had water running through, and the accumulation of wind-blown sediments at the end of this glacial period caused the formation of these fossil dunes. 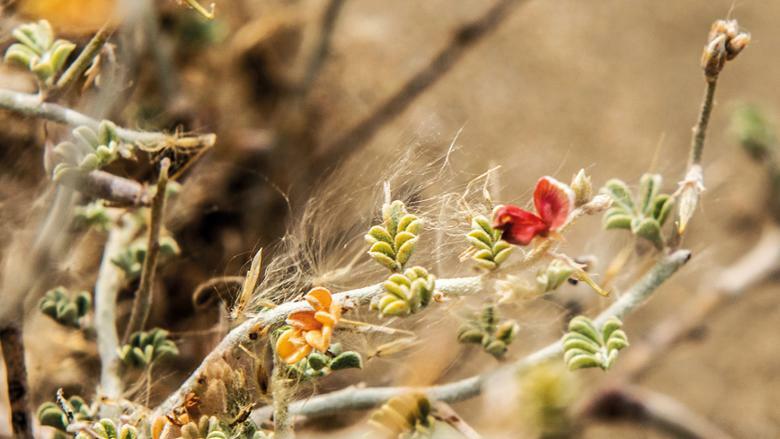 The Al Wathba Wetland Reserve is a microcosm of different habitats including fresh water bodies, saline lakes, tall-reed marshes, gravel plains, sand dunes and sabhka, which make it a natural refuge for a high diversity of flora and fauna. Designated a nature reserve in 1998 by the late Shaikh Zayed Bin Sultan Al Nahyan following the first successful breeding of the greater flamingo (Phoenicopterus roseus) that year, it is the Environment Agency — Abu Dhabi (EAD) that is tasked with biodiversity protection and conservation here. The reserve supports a rich array of wildlife and many globally and locally threatened wetland species. 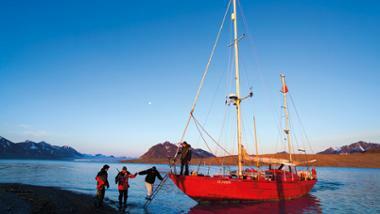 In total, the site is home to over 260 migratory and resident birds, 11 mammals, 16 reptiles and over 39 plant species. It is also home to more than 5,000 flamingos. Looking across the reserve, you notice that it is covered with herbs, grasses, shrubs and trees mostly growing in dense clumps or tufts. 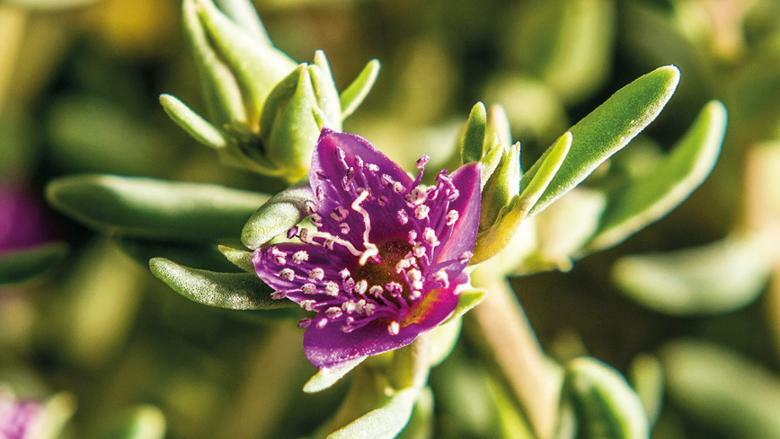 One area is covered in a blanket of yellow as the tiny flowers belonging to the perennial white bean caper Tetraena qatarensis, a wild plant native to the Arabian peninsula, paints a pretty picture amid the varying shades of green and brown all around it. ‘This is the most widely distributed plant here and camels tend to steer away from it because it is too bitter and salty,’ says Claudia. 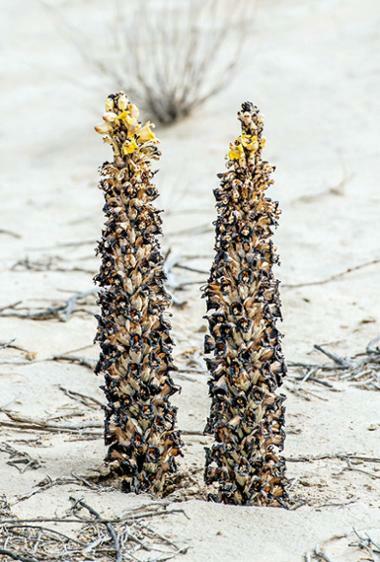 A little ahead we spot the desert hyacinth, another leafless parasite fleshy herb. Its dazzling yellow flowers are surrounded by a swarm of painted lady butterflies (Vanessa cardui) that are known to cover up to 100 miles a day during migration. Mustafa describes how the plant survives by sucking water and nutrients from its host plant to which it is attached via a thin root that can extend over a distance of several metres. The afternoon air at the Al Wathba Wetland Reserve is resonant with the tweeting and chirping of the myriad winged creatures that live here. 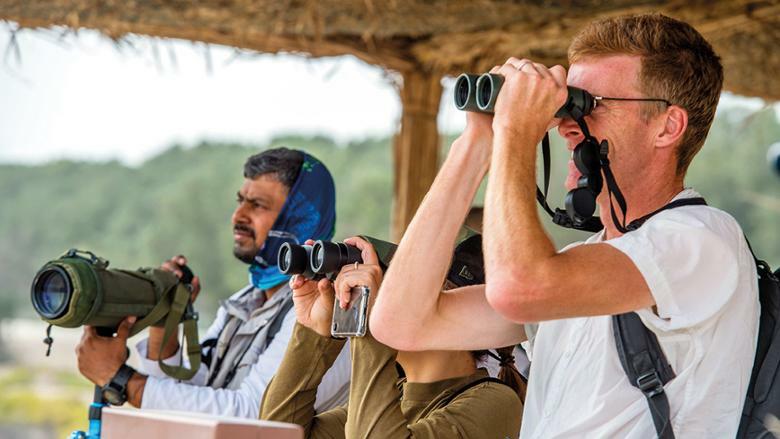 This is a birdwatcher’s paradise and it is sheer joy to be listening to the calls and birdsongs from a range of species, including bee-eaters, bulbuls and lapwings as they dart about in the shrubs and thickets or remain hidden in the dense foliage of trees. Pointing to a small sandy hillock, Claudia describes it as a special dune structure known as nebhka that is formed by the interaction of wind-transported sediments and certain plant species that are able to stabilise the sand. Two such plant species around which the sand mounds are formed here in Al Wathba are the saltbush (Haloxylon salicornicum) and the white saxaul (Haloxylon persicum). Nebhkas are important to the ecosystem as they are home to a variety of burrowing animals, including foxes, small reptiles and insects. 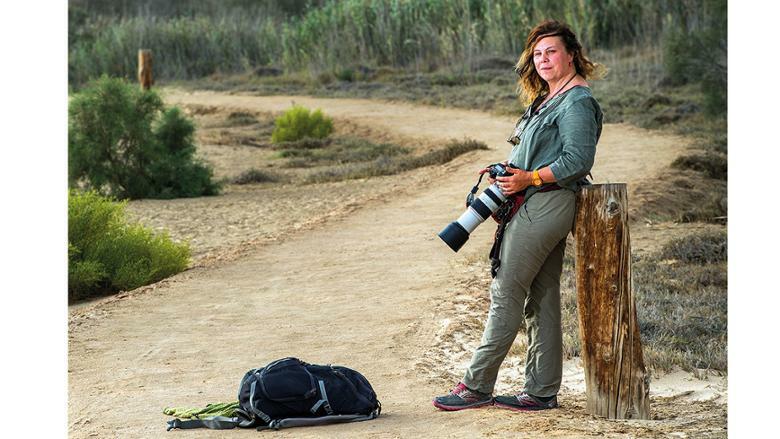 We explore different habitats and listen in earnest as Claudia tells us that the majority of the plants in the reserve are halophytic species, which are specially adapted to live in saline environmental conditions. 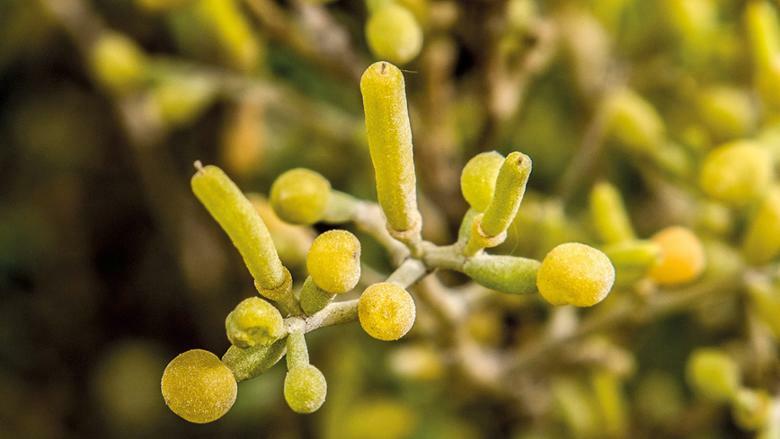 We are intrigued by the toothbrush bush (Salvadora persica), which, as Salem points out, ‘is commonly known as arak and its dried twigs or roots called miswak are used for cleaning teeth’. It is the Tamarix tree (Tamarix cf. ramoissima) that Claudia insists we should not miss for ‘its leaves collect dew in the morning, which later drips onto the ground thus irrigating the plants and, in the process, providing a micro-habitat for other flora and fauna’. We walk deeper into the reserve and enter a narrow pathway framed by 5m-tall reed plants that provide a habitat for birds, mammals and reptiles. 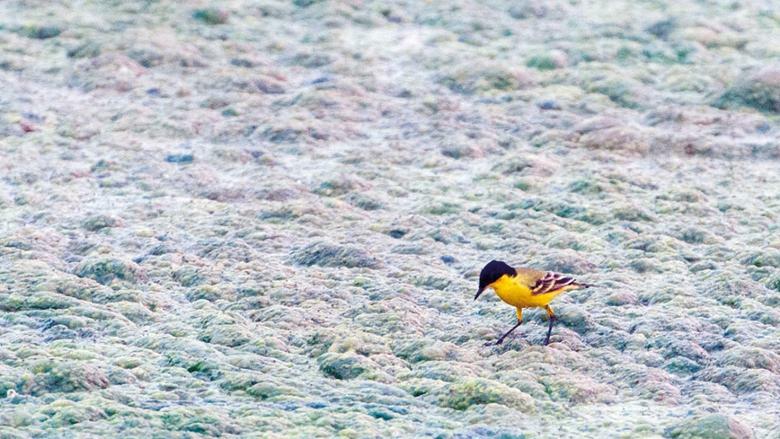 Nearby is a large, natural lake where we find around 30 black-winged stilts in the company of lapwings and plovers. These wading birds are resident breeders and found in shallow waters where they feed on aquatic invertebrates and insects. He also points out a group of black-necked grebes with small yellow tufts swimming in the lagoon who, he adds, will sport a glorious breeding attire of a unique ochre-coloured plumage during the mating season. 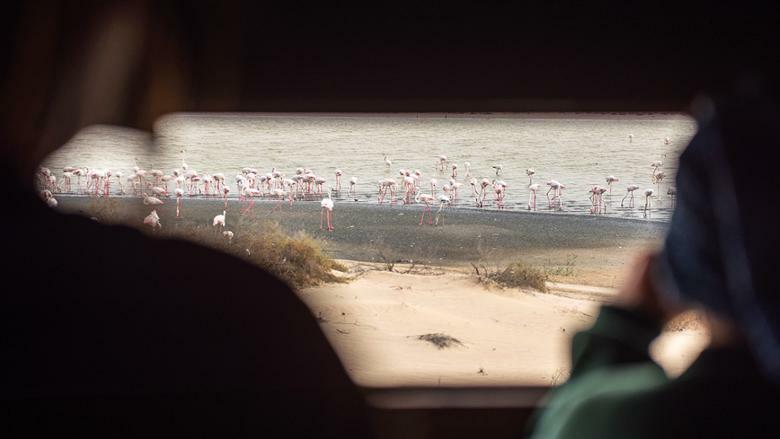 No visit to Al Wathba Wetland Reserve can be complete without seeing its flagship species, the greater flamingo. As we walk towards the observation hide, their distinctive loud, nasal honking calls comes through loud and clear. Their gorgeous bright pink plumage, spindled legs and long, curvy necks are a sight to behold especially when there are thousands of them spread out across the large lake. 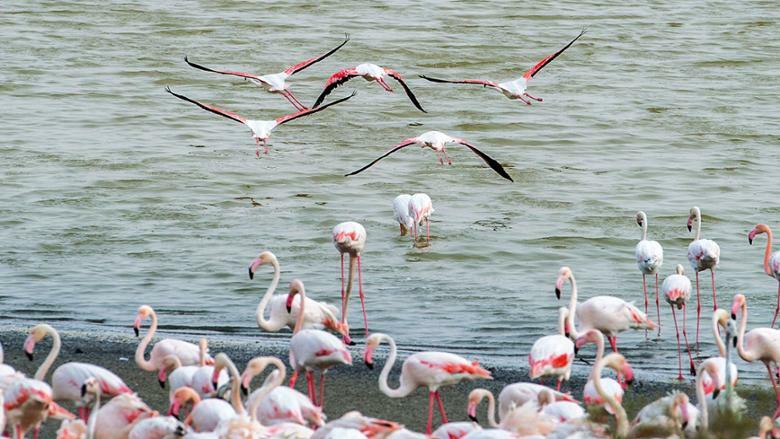 Their pink colour comes from beta-carotene in the crustaceans and plankton that the flamingos feed on, he adds. We step over crystallised salt formations caused by the drying up of the saline water as we make our way to witness the sight of the Western Marsh Harriers coming home to roost amongst the tall grass, safely hidden from foxes and other predators. By now the sky has turned a golden hue and as we trace our steps back to the visitor’s centre of the reserve from where we had set out on this incredible journey of discovery. All at once we spot a flock of flamingos flying right towards us, their wings outstretched, the tips of their black flight feathers highlighting ever more so the fiery brilliance of their flamboyant pink tone. 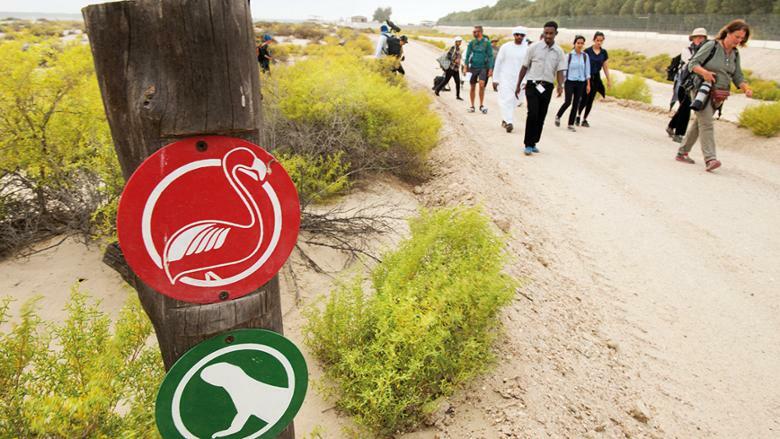 • Al Wathba Wetland Reserve is open until end of April on Thursdays and Saturdays only. Timing: 8am to 4pm (Last entry is at 2pm). It reopens in October. • Closed, comfortable shoes are a must. 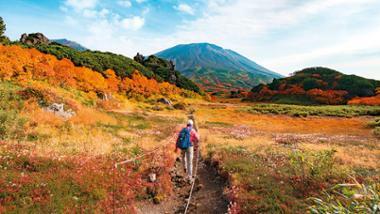 Carry ample drinking water and snacks. Slather on sunscreen and wear a cap and sunglasses. 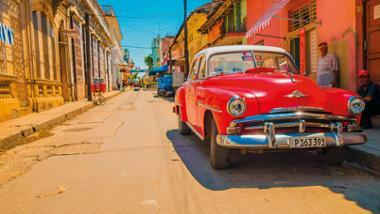 • Avoid bright coloured clothing; preferably wear brown, beige or green attire. • Equipment required: binoculars, camera. • Patience is a must — do not rush through if you want to fully imbibe the beauty of the natural world.